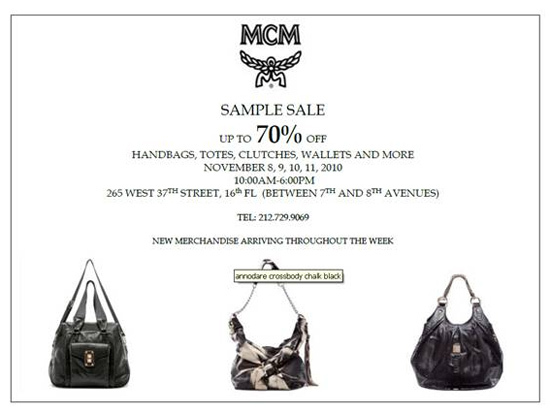 MCM, a brand synonymous with luxury and elegance, is having a sample sale on November 8 – 11th 2010 from 10:00am – 6:00pm at 265 West 37th Street, 16th Floor. Sophia Eugene and The Cue! The FINAL sample sale. Not to be missed. Winter coats now 80$ from $350. Holiday Cocktail dresses as much as 80% off. Tons of sweaters 70% off.